Nonfiction from Kelly Barth, slam poetry by Steph Castor, and a bit of a play by our own Scott Ross. What was happening at the beginning of March? We can’t remember, as those of us here at Sunflower Reading Series spent the month hidden away in cavelike retreats rushing to complete MFA theses. Luckily, we still managed to do our monthly roundup of the local literary scene, this time featuring the #LFK Poetry Slam, local playwright Scott Ross, and memoirist Kelly Barth! Download the full episode, or scroll down for individual stories! Steph is a KU grad and performance poet who on a quest to make a home for slam poetry in Lawrence, Kansas. She talked to us about organizing the #LFK Poetry Slam, inviting the public to match words at the Granada Theater, and the effort to overcome that Midwestern politeness for an event where you’re supposed to talk back at the stage. And she threw in a few of her own poems to sweeten the pot! It turns out KJHK News Director Scott Ross doesn’t spend all his time at the station. When he can slip away for a few minutes, he also writes scripts. 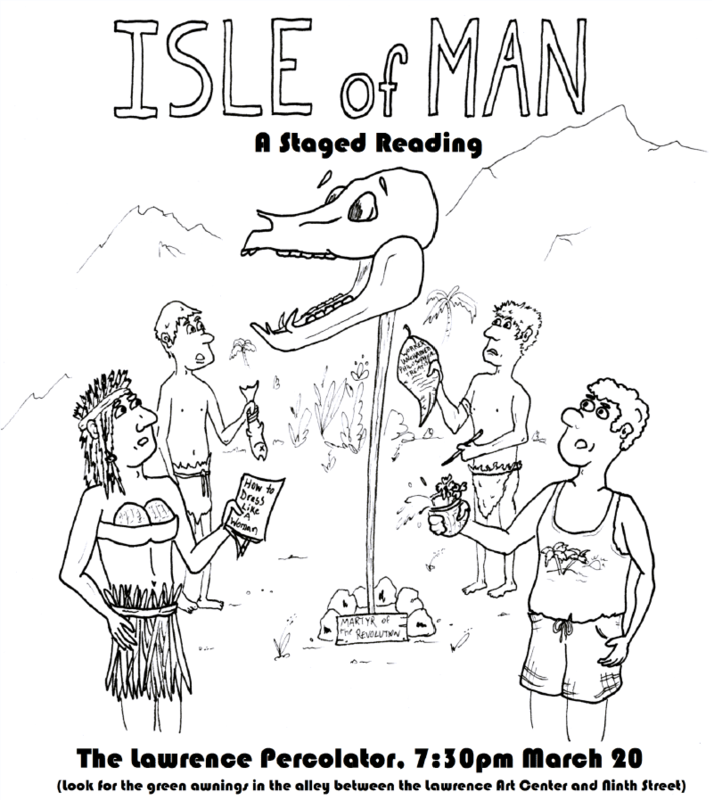 He took a turn on the other side of the microphone to share a segment of his thesis play “Isle of Man”, an unsolicited sequel to Lord of the Flies which received a staged reading this month at the Lawrence Percolator. He was assisted by readings Phil Garland, Justin Wilson, and Luke Reddig. You may have seen Kelly if you’ve ever stopped in to the Raven Bookstore during any of their Thursday night Big Tent Reading Series. This month, Kelly stepped out from behind the counter to read her own work. She also sat down with Scott to share an excerpt from her memoir My Almost Certainly Real Imaginary Jesus – in which the protagonist encounters a Kansas City-area evangelical group seeking to “cure” homosexuality. Written by Scott Ross. Tune into Sunflower Reading Series the first Thursday of every month at 7pm on KJHK 90.7fm.